The Science Behind Haiti's Earthquake Haiti sits right at the spot where the tectonic North American plate and the Caribbean plate meet. One fault line runs straight through Port-au-Prince, making it earthquake country as one gigantic chunk of the Earth's crust grinds past another. 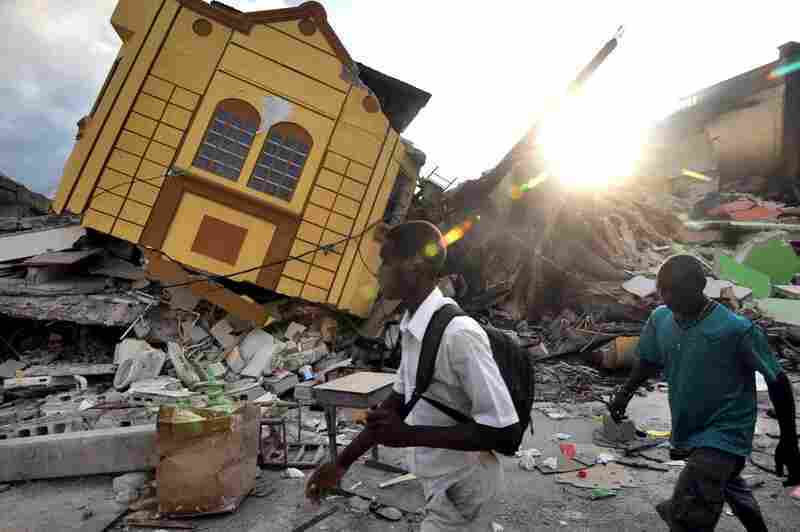 Though we don't necessarily think of the Caribbean as earthquake country, it most definitely is. The earthquake that devastated Port-au-Prince on Tuesday occurred along the boundary of two tectonic plates — great slabs of crust that slide past one another slowly over time. In this case, the Caribbean plate is moving east in relation to the North American plate. Large earthquakes frequently occur on these plate boundaries. The Caribbean plate has been moving about a quarter of an inch per year, relative to the North American plate. But the two plates don't simply glide past one another. Strain builds up along faults at the plate boundaries, until it's released in a sudden burst of energy. That's an earthquake. 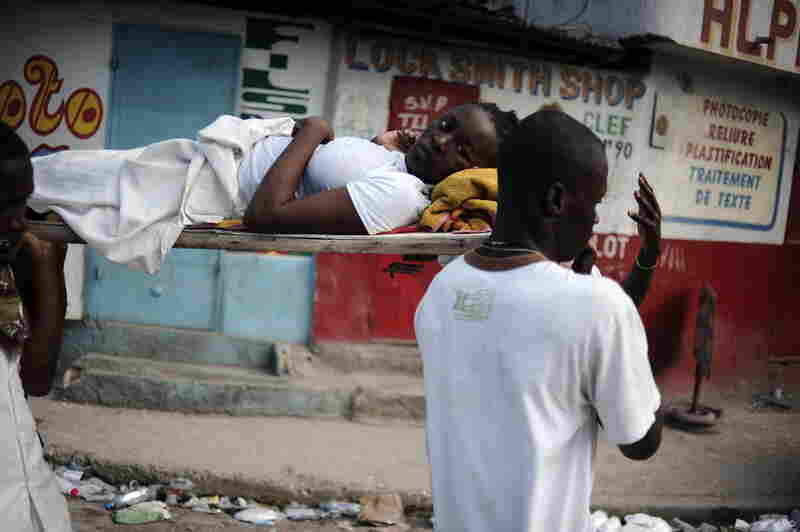 Injured people rest in the streets of Port-au-Prince Thursday, two days after the devastating 7.0 quake. 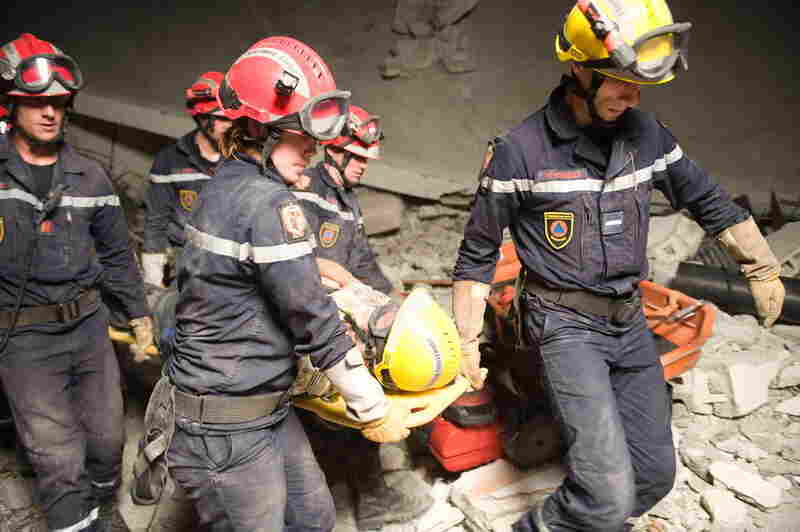 Rescuers carry an injured girl down the street after digging her out of the rubble Thursday. Virginia Cary, of Cleveland, Tenn. waits at the Port-au-Prince airport in hopes of a return flight to the U.S.
Fireman attempt to put out a blaze in Port-au-Prince Thursday. 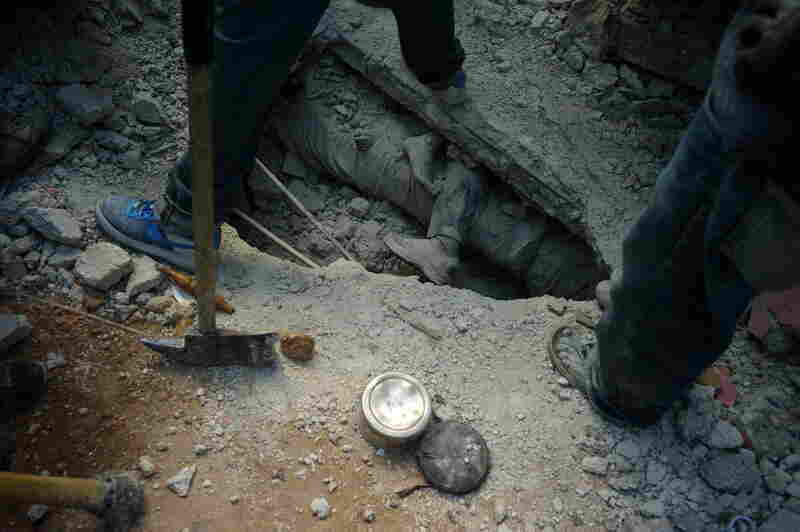 Workers dig for bodies in a fight against time. 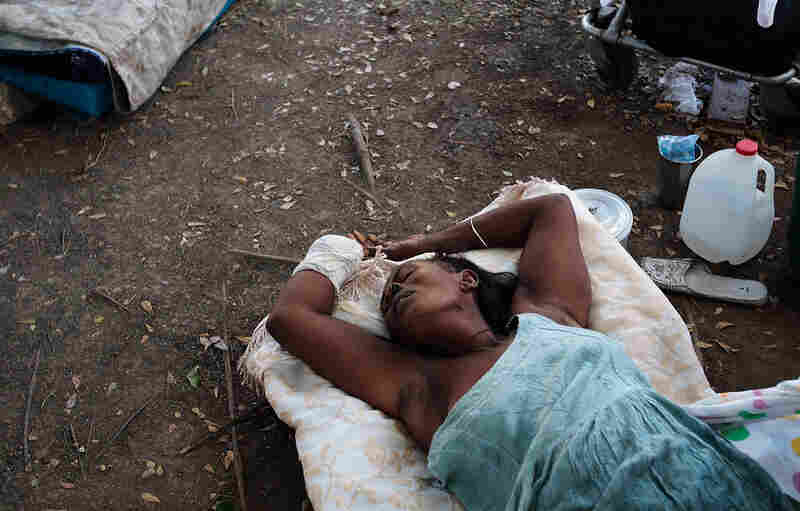 A woman who lost a hand lies on the ground outside a makeshift recovery ward in Port-au-Prince Friday. 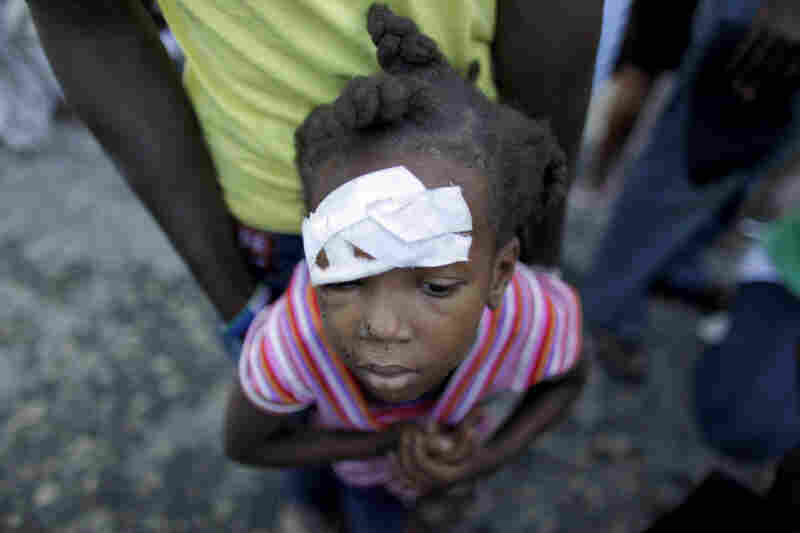 An injured child waits for medical attention near a damaged hospital in Carrefour, on the outskirts of Port-au-Prince, Friday. People line up to for gasoline. 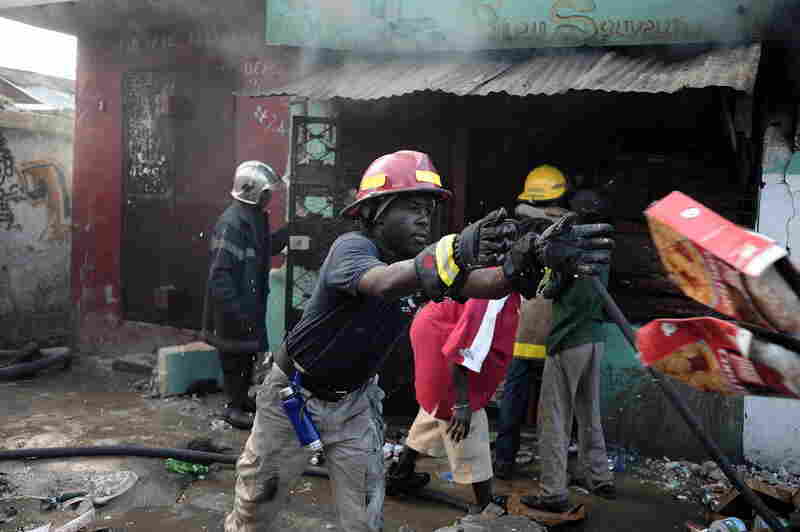 Aid organizations are struggling to get needed resources to survivors. 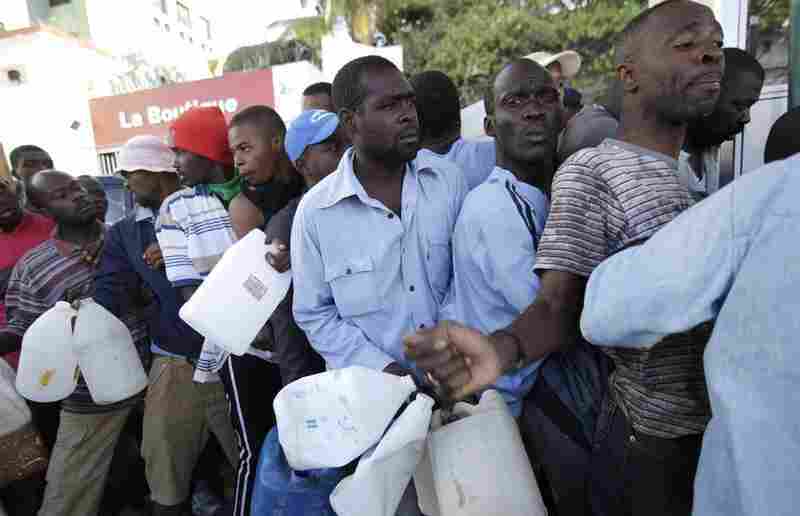 People line up to receive water, an in-demand commodity, from a firetruck in Port-au-Prince. Earthquake survivors use water from a fountain to bathe in the central public garden of Port-au-Prince. 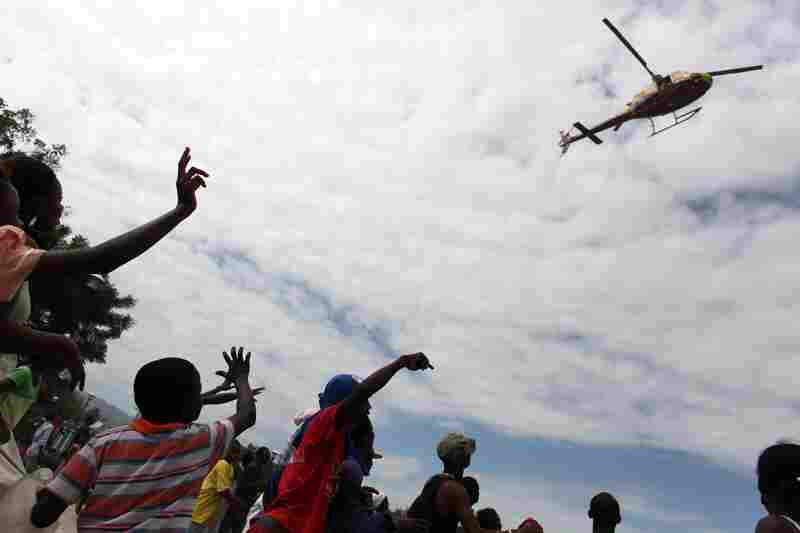 People wave at a helicopter in the center of Port-au-Prince. 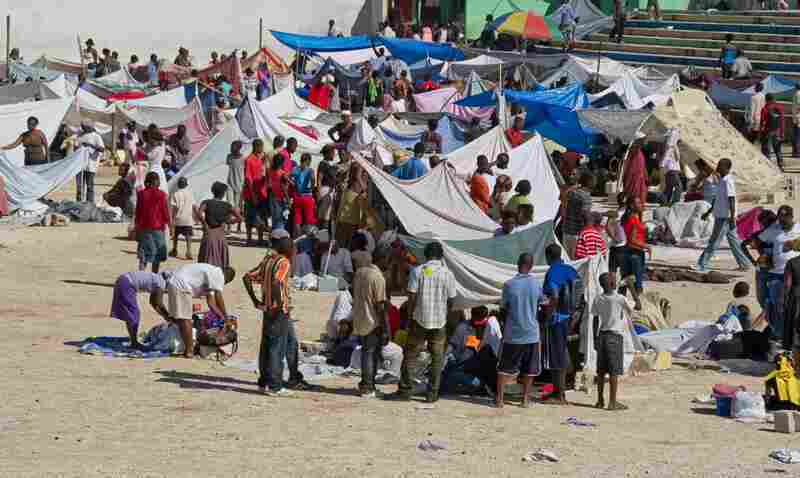 Aid efforts are slow to reach the Haitian capital. The magnitude of the disaster is overwhelming relief efforts. 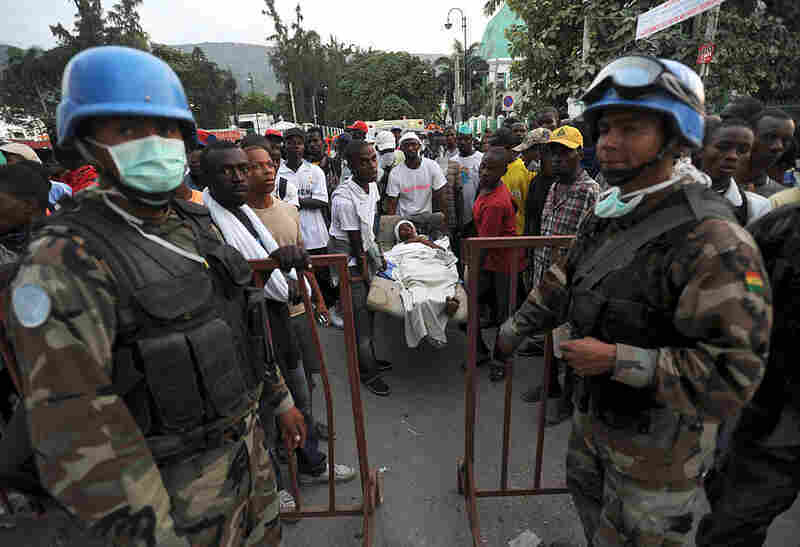 Bolivian U.N. Blue Helmet soldiers stand guard at an aid center in Port-au-Prince as a group of Haitians carries a victim. 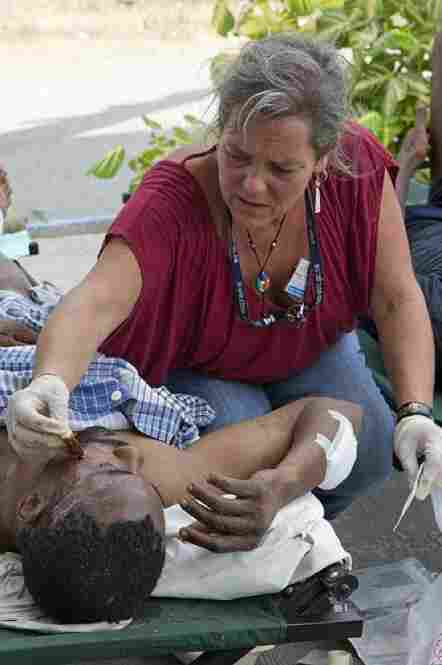 A staff member from the U.N. Stabilization Mission in Haiti, or MINUSTAH, treats an injured man. 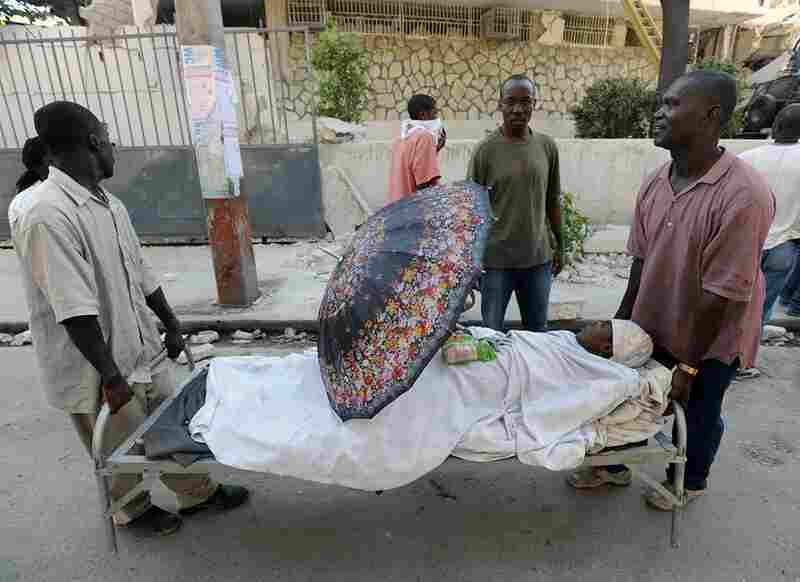 Men carry an injured relative in Port-au-Prince. 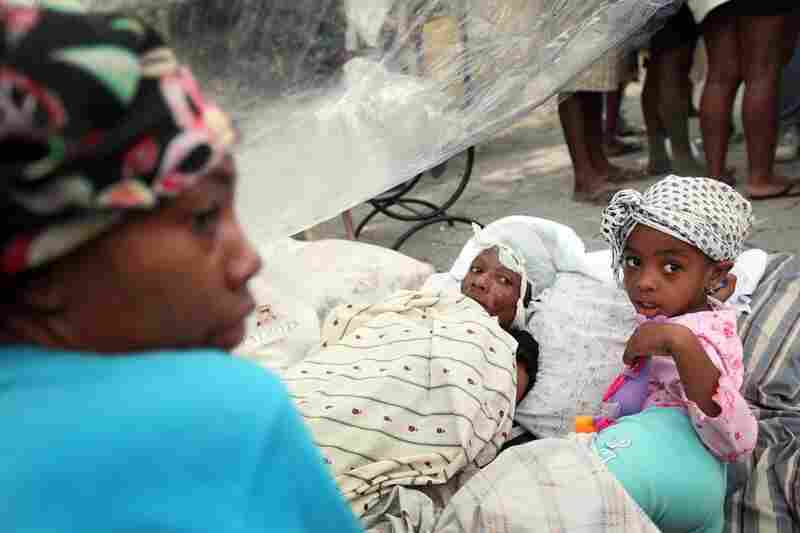 The Haitian Red Cross estimates that more than 50,000 people may have been killed in the earthquake. 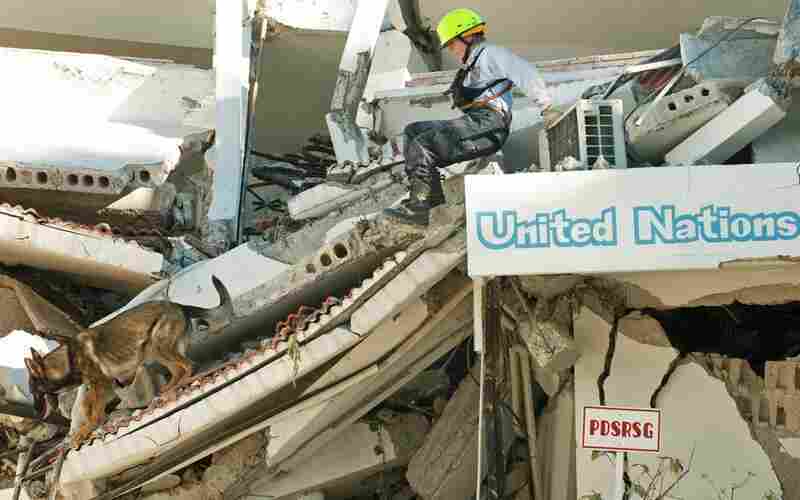 A member of the Fairfax Country Urban Search & Rescue Team and her K-9 partner search the U.N. Headquarters for more survivors after freeing a man who was trapped for 40 hours in the rubble. 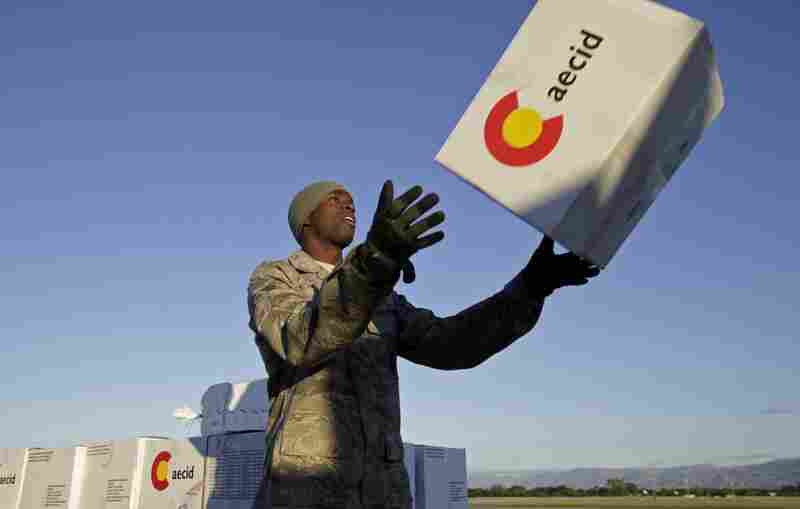 Aid trickled in Thursday morning. Here, Maurice Cain, senior airman with the U.S. Air Force, unloads humanitarian supplies from Panama at the Port-au-Prince airport. 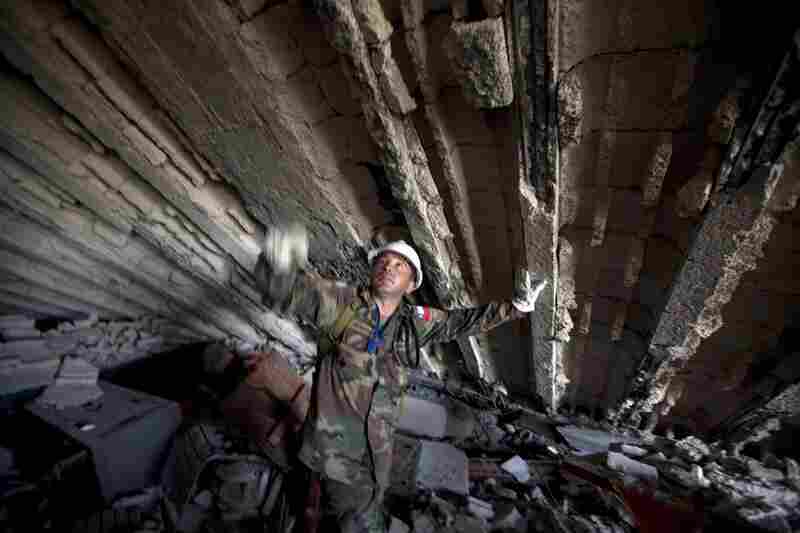 A U.N. peacekeeper from Chile works in the rubble of the Montana Hotel. With thousands missing and the death toll climbing, dazed survivors wander amid the ruins of Port-au-Prince two days after the devastating earthquake. 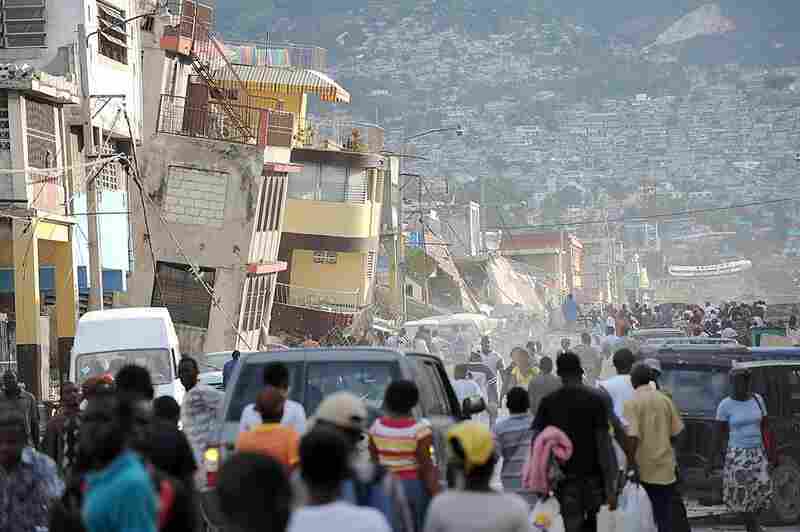 Haitians walk though streets filled with rubble and bodies. Displaced people create makeshift shelters out of tarps and sheets. A woman prepares a bed in the street Tuesday night after the quake. 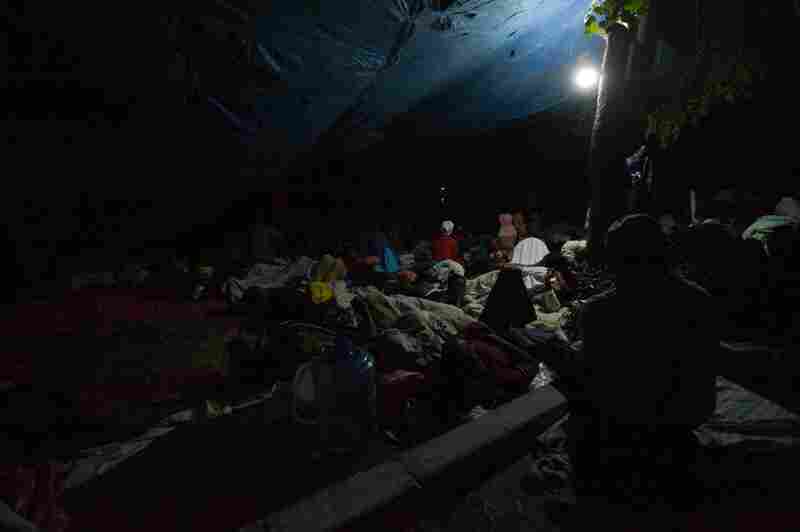 Many Haitians spent a second night on the streets. 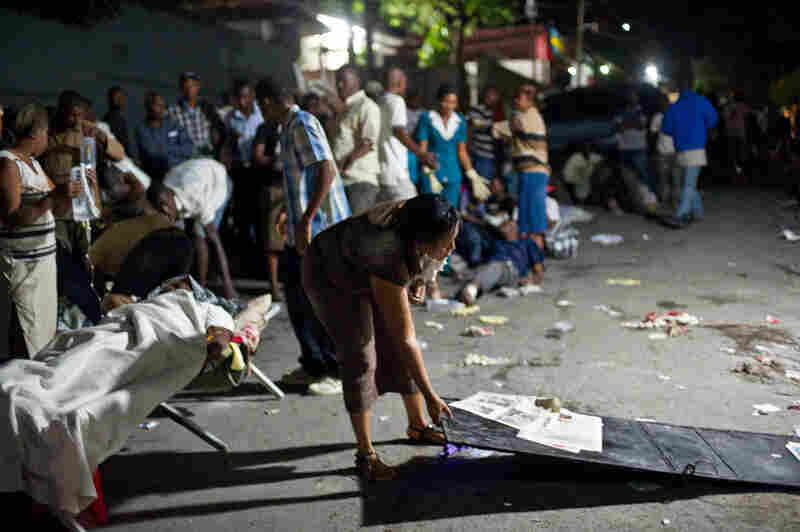 Here, people gather on a square in Port-au-Prince's Petionville district. 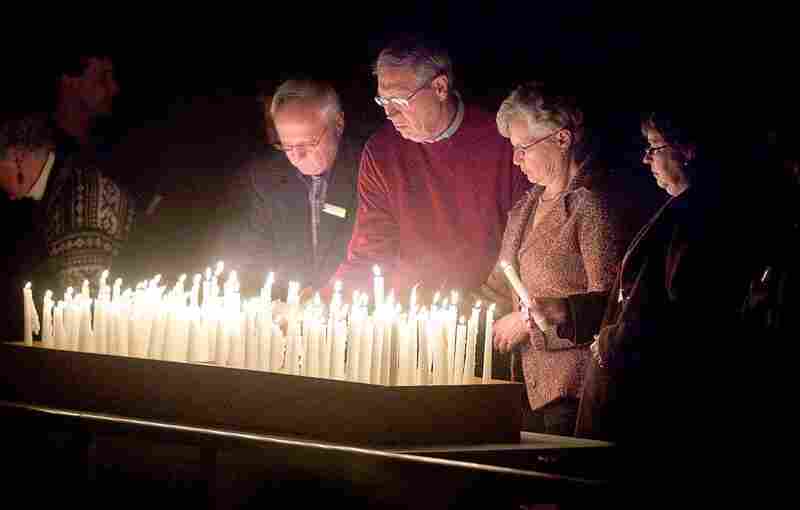 Members of the congregation of First Lutheran Church in Duluth, Minn. pray for the earthquake victims Thursday. The pastor's son is believed to have been killed in the quake. 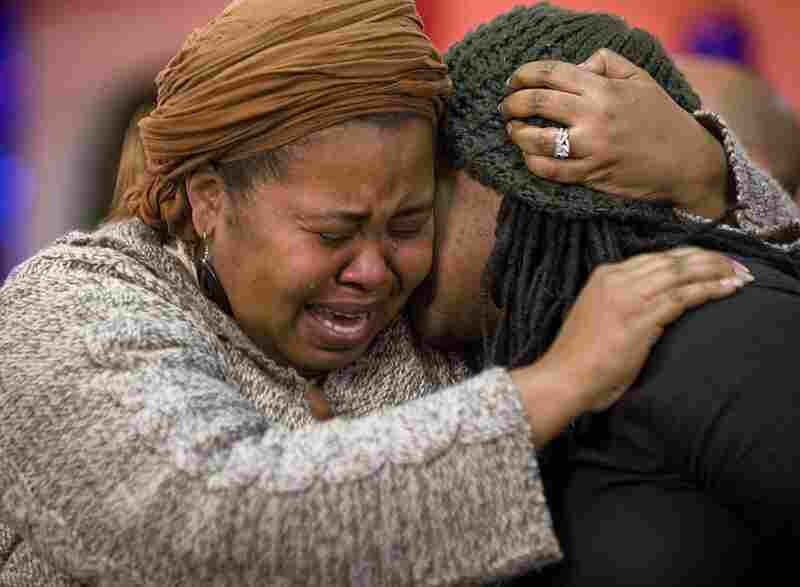 Members of Canada's Haitian community comfort each other at the Haitian-Canadian Community Center in Montreal. There are two major faults along Hispaniola, the island shared by Haiti and the Dominican Republic. This earthquake occurred on the southern fault, the Enriquillo-Plantain Garden fault system. There hasn't been a major quake on this system for about 200 years. That means stress has been building up there for quite some time. When the strain finally grew too large, rock along the fault failed, and released a huge burst of energy in less than a minute. Geologists are still working on the details, but it appears that 30 to 60 miles of the fault gave way. That not only triggered the original quake but has also generated more than a dozen aftershocks of magnitude 5 or higher. Those are also strong quakes, and they pose a risk to the buildings that were damaged in the original shock. Aftershocks are common after large quakes, and they continue for days, weeks and even longer — though they become less frequent as time passes. Earthquakes in this region often originate at a point in the Earth that's relatively shallow. In this case, preliminary estimates say the rupture started about six miles below the surface. 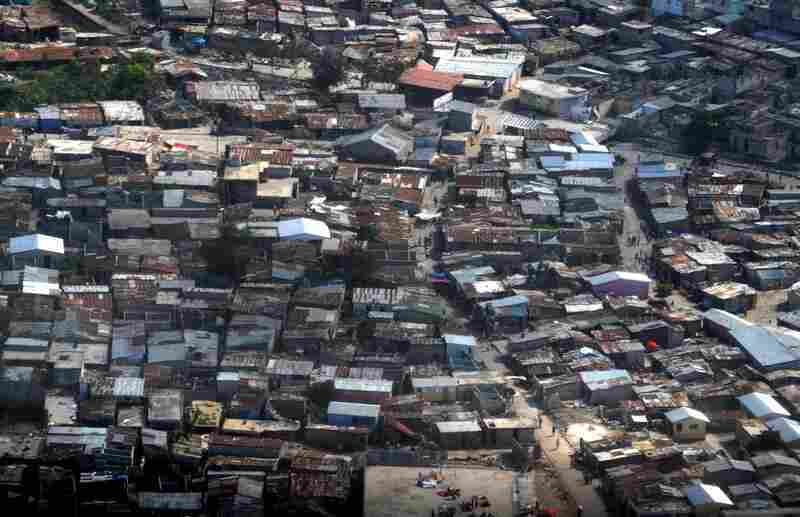 Since Port-au-Prince was only about 10 miles away from the quake's epicenter (which is the spot on the surface directly above the origin of the earthquake), the ground motion in the city of 2 million people was especially intense. Geologists say the fault is a "strike-slip" fault, like the San Andreas in California. That means the relative motion between the two tectonic plates is mostly a side-to-side slip, rather than up and down. The second fault system on Hispaniola runs mainly on the eastern end of the island, in the Dominican Republic. That Septentrional fault system hasn't experienced a major quake for more than 800 years, but it holds the potential for producing another devastating quake — quite possibly larger than the one that struck Haiti on Tuesday.